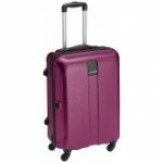 Amazon selling Safari Thorium Polycarbonate 66 cms Purple Hardsided Suitcase (Thorium-Stubble-Magenta-Purple-65-4WH) Rs.2696 which is worth Rs.6740. Best and Cheapest price online .Keep Visiting dealsheaven.in for more Best offers ,hot online deals, promo code, coupons and discount . How to grab this deal ?